Cane Hill was an architecturally unique hospital, not built to one of the standard specifications that evolved over time. It did share common characteristics with the majority of other asylums, such as centralised services, distinct gender segregation, and segregation between different types of patients. Cane Hill also had unique characteristics, due in part to being an experimental design. The majority of mid nineteenth century asylums were built to a linear plan, with navigational spaces sharing accommodation. At the foot of each ward would be a corridor running the length of the hospital, and persons who had no business in the ward would need to walk through it to get to another. This caused obvious problems, transportation of patients, disruption and privacy being a few of them. Charles Henry Howell’s first two Asylums were Brookwood, Woking, and Fairmile, Berkshire’s. each were built to a linear plan, yet needed regular extensions throughout their existence as the population in local towns grew with the industrial growth of local companies. Howell’s design for Cane Hill made maximum use of the space available, ensuring that it wouldn’t need extending. Indeed, there was little scope to do so, meaning Howell had to ensure the design was absolutely suitable. His experience of building at Fairmile and Brookwood (Surrey’s first county asylum) would have taught him to fully maximise space available to accommodate the maximum number of patients. Cane Hill could not be realistically extended further than it was at this point, and if room had been found for further accommodation, the workload on the laundry and kitchens would have been overwhelming. The Pavilion was the next significant design. The wards came from a central corridor, but they did not intersect. This meant that patients were afforded relative peace from other wards, but the issues with it were that operations proved difficult. Again, corridors were busy and certain parts of the hospital were not close to the services they needed to be near. Florence Nightingale made recommendations that led to these designs, but while they may have proved suitable for short-term medical patients, they were not suitable for accommodating long-term residential mental health patients. The partially detached style of these hospitals alleviated some of the issues with the Radial and Corridor plans. What Cane Hill’s design did offer was versatility. It was easily extended in 1888, with 4 further 3 story blocks added at the rear of the hospital (Howell had planned for this), and should a ward not be required any more, it was easily sealed, unlike an Echelon or Corridor plan. Ironically, this made its complete closure far easier than other hospitals, as patients from Cane Hill were dispersed towards closure. With the Compact Arrow plan, the wards did not intersect the corridors, yet many buildings were readily accessible from each other. The wards were usually built to very similar designs, unlike Cane Hill’s. The design is distinct from a corridor plan as the corridors do not interfere with the wards, and distinct from a pavilion because every ward is south facing. This map below clearly articulates where the corridors were at Cane Hill (red). The Male and Female sides were identical in this respect; excluding the 1888 additions (Within the green boundary.) Inside the central rectangular corridors were the chapel, kitchens, Main Hall and stores. Each ward is distinctive from the others by its placement, defining each as a pavilion. As they radiate around the central services, and each ward is a pavilion separate from the corridor, this design is thus called a Radiating Pavilion. 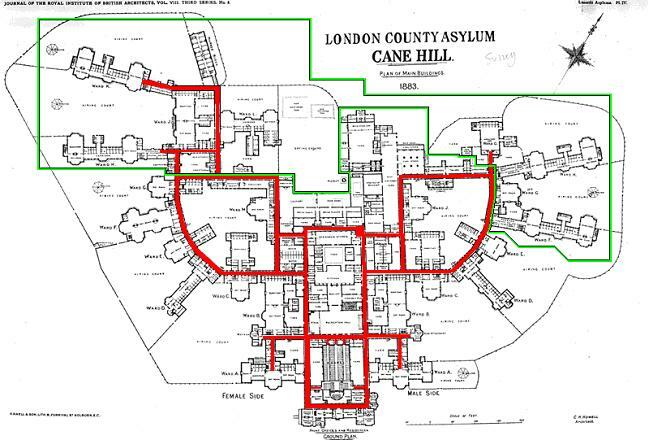 Cane Hill had 49 different wards, built in 8 different styles. This allowed it to serve a whole range of needs, from epileptics to acute, chronic, refractory, short term; drug addicted and violent. Cane Hill could catch them all. The variety of design makes Cane Hill a unique place. Other architects [such as GT Hine, and William C Clifford Smith] designed their Southern asylums to be aesthetically pleasing, yet Cane Hill appears repressive, utilitarian and functional, similar to a prison. Bunched up buildings prevent appropriate levels of light entering the wards, and the unique ‘radiating pavilion’ design meant that doctors had to re-enter the corridor network to access the next ward, except in a few instances. The Government had to authorise each set of plans for design and cost. This was partially due to the amount of public funds spent on these institutions within a relatively short space of time, and also the stigma attached towards the mentally ill, which meant that locals resented their rates being spent on the insane. At Severalls, Colchester, the preferred plan was rejected, as it was not the cheapest of the 22 tenders made. Architectural embellishments were frowned upon, and buildings had to be cost effective. As designs developed, the principles that Cane Hill was built on were used in the Echelon designs, of wide and compact arrow, established and popularised by GT Hine. In 1893, just 10 years after Cane Hill was opened, The county of Essex opened their flagship asylum at Claybury, on the edge of North London. This was the first Echelon, or ‘Compact Arrow’ design and was so successful it was adapted and replicated across the country. Subscribe to comments with RSS or TrackBack to '2.2. – The design of Cane Hill Hospital'. I have been looking at your website for some time now, as a local resident and student of history. I was wondering where you found the structural drawing of Cane Hill? Or if you had a larger copy?